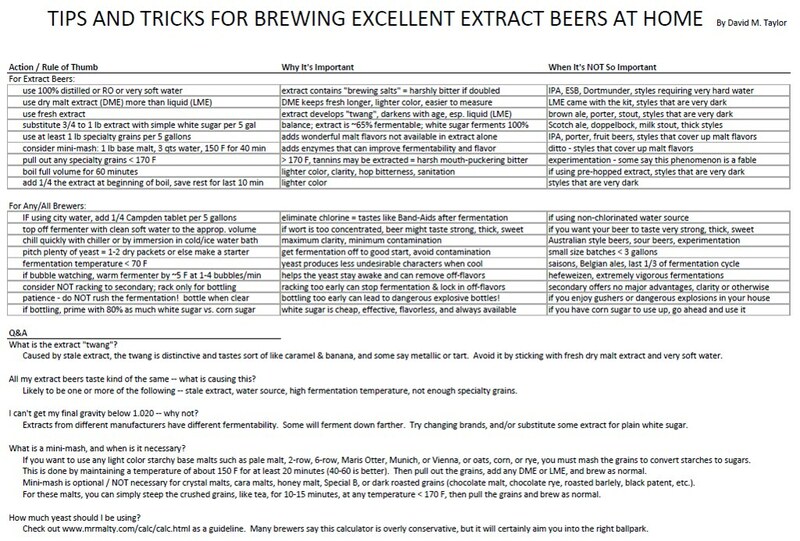 This would be my forth brew and I have always followed the recipes but I am not sold on making this one as is. I am wanting to add some flavors or change it up, but I have no confidence on doing this on my own. Any ideas of different flavors that may work? I currently have a blackberry wheat in the fermenter, have made a ginger saison, and a scotch ale. Let me know some idea. Thanks! Re: Any Recipe Tweak Ideas? Easy options would be (1) change up the hops and/or (2) reduce or change up the specialty malts you have there. It looks like you've got a low alpha acid EKG hop there... you could go with something piney like simcoe that would go well with an amber. you could keep it at the bitterness it's currently at or go a bump more hoppy. If you want to start tweaking recipes I'd suggest a software like Beersmith which makes these tweaks super easy to see the impacts in real time. That recipe is not bad, but you may want to remove 1 lb of the DME and use 1 lb cane sugar instead. This will ensure your final gravity is as expected and prevent sticky thickness in the final beer (unless you like it really sweet). That's where I would start. I like a fair amount of Munich malt in my amber ale. You could use Munich DME instead of some or all of the amber DME. You could also try a different yeast to get more flavor, like WLP041 Pacific Ale Yeast or WY1332 Northwest Ale Yeast. I don't like hoppy amber ales, so I would leave the hops alone. Thanks for the ideas so far, keep them coming. Looking at the ingredients, there is a lot of caramel malt in that beer. I agree with Dave’s suggestion trying to dry out the beer with table sugar. You may also add some Gypsum: 1-2 tsp. To the boil to accentuate the hops. If you want a more west coast amber, I would suggest more hops. Keep their bittering addition (likely at 60 minutes). Move the rest of their hops to 1 minute boil. Then add some whirlpool and dry hops. Maybe 1-2 ounce of each. I would pick an American C-hop for the late additions (Cascade, Chinook, Centennial). I'll second using Pacific Ale Yeast--I used it for an amber ale last summer that was great--will be making it again in another month or so.